Your search for a suitable tripod might take you everywhere but it can certainly end with the highly efficient breed of Vortex Tripods. Whether it is a lightweight tripod or a conveniently portable one, a rigid tripod or a strong one, an easy to set up tripod or a cost effective one you are looking for, you’ll get it all right here. In the offing are scope mounting tripods that are in sync with the description you have in mind and ideal for comfortable viewing, satisfactory observation and target oriented operations. 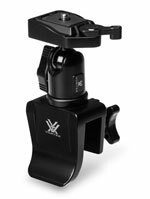 Vortex Tripods offer a full range and a full size, and come in compact sizes. The tripods also feature lots of adjustment capability to add to the convenience factor. What’s more, they are easy to set up, pack and store. Apart from hunting, bird-watching and nature study, you may use these professional tripods for other activities like digiscoping and photography. So wait no more. Get the sturdy and stable platform for extended long distance viewing, and enjoy sharper pictures and enhanced framing precision like never before.